When we first arrived here on the South shore we were very impressed by the signage on the Highway for the main towns of Lunenburg, Mahone Bay, Chester and Bridgewater. These are large attractive signs that try to say something about the town. The one for Lunenburg shows the colourful painted houses and the Bluenose II racing schooner. 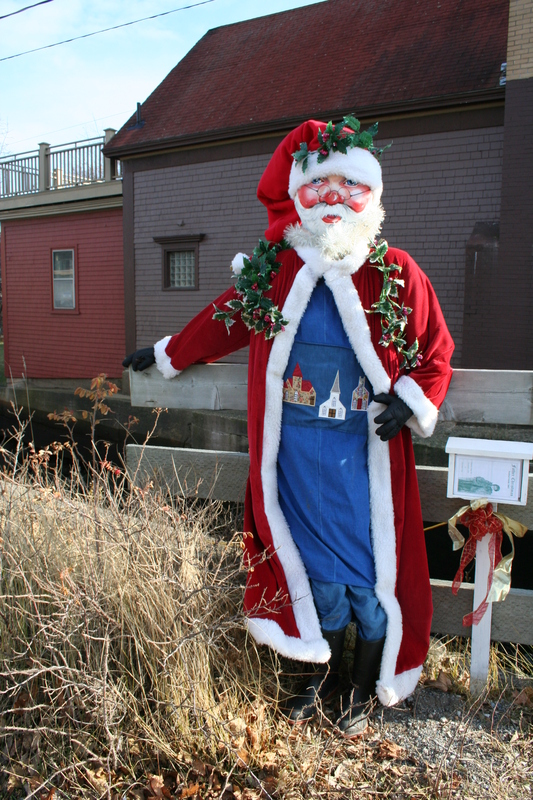 Whereas the one for Mahone Bay shows the famous three churches side by side in the bay. Further down the highway is the unremarkable town of Liverpool whose claim to fame on its highway sign is something to do with being the home of the privateers! So not too dissimilar to the Liverpool in the UK! They have a Privateers festival every year (instead of a Highland Games). Something that amuses us greatly is the choice of names for towns, hamlets or regions. Sometimes it seems as if the new inhabitants were lacking in imagination. Just along from us here at Lunenburg, there is an area (not even a village but a typical spread-out community) called Centre with a large school called Centre School. Then along the road is Front Centre and Back Centre. Sounds a bit like the players in a football team. Near Bridgewater there is a Northfield, a Lower Northfield, an Upper Northfield and a West Northfield. We haven’t found North or South yet. It’s a similar story with Branch, Upper Branch, Lower Branch and Midville Branch and Middle River, Lower Middle River, Upper middle River and West Middle River. Then there are the villes. Harbourville, Centreville, Farmville, Margaretsville, Summerville, Woodville, Wolfville, Smithville, Wileville, Thomasville and Granville: to name a few. Of course, there are many Scottish place names, with Inverness, New Glasgow, Port Clyde, Dalhousie, New Ross, Scotch Village, Caledonia, Wallace Bay, Dingwall, Mackinnon’s Brook, Macdonald’s Glen, Glencoe, Glen Tosh, Piper’s Glen ………………………………. Surnames here are very unusual – but I’ll leave that for another day. 26250 Woodstock Road – The Middle of Nowhere! On Sunday we decided to have a drive along a track (Woodstock Road) which goes out through the woods at the back of Mahone Bay. We had tried to drive out this way last year but the snow was very deep and we eventually turned around when we came across a broken down snow plough and an impassable road. This is a dirt road that runs through the middle of nowhere between Mahone Bay, Walden and then Maplewood. Louise and Cameron had a trip here before Christmas and told us about coming across a pub on this road???? There are some cabins along the road and a few tracks off to ??? houses, lakes?? The aspen trees were fabulous and there were some really old cedars and white pine trees. You can see the road has been cleared in front of it, but what is it and why is it here? Is the lobster creel on the roof of any use or just decorative? The ‘Walk in and Stagger Out’ sign would definitely make you think it is a pub, but what about the ‘Enchanted Crystal’, or the ‘Penny Farthing”? Unfortunately the place was closed, so we will have to have another trip out there to find out what it is and who goes there. It would be a great cycle out if we could be guaranteed a refreshment. 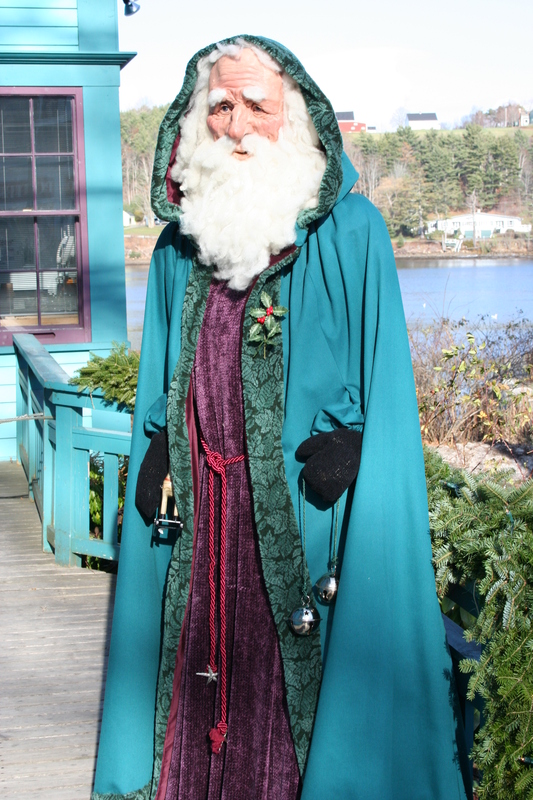 This is the second year that we’ve attended the ‘Father Christmas Festival’ at Mahone Bay – last year was with our friends from new Brunswick. The weather was freezing and Helen and I didn’t manage to do what we’d planned as Jeff and Euan failed to meet up with us at the designated spot – having, as usual, not listened to our directions.This year, the weather was much warmer and we had Louise and Cameron to accompany us. 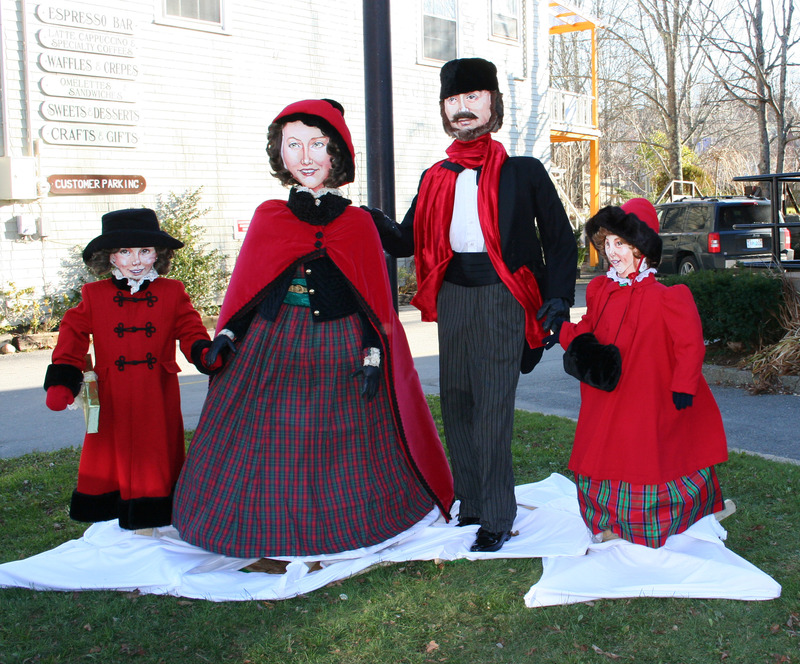 Mahone Bay does a good job of decorating the town with life-sized figures. Some of you will remember my photos earlier this year of the ‘Scarecrow Festival’, when the shops had similar figures. 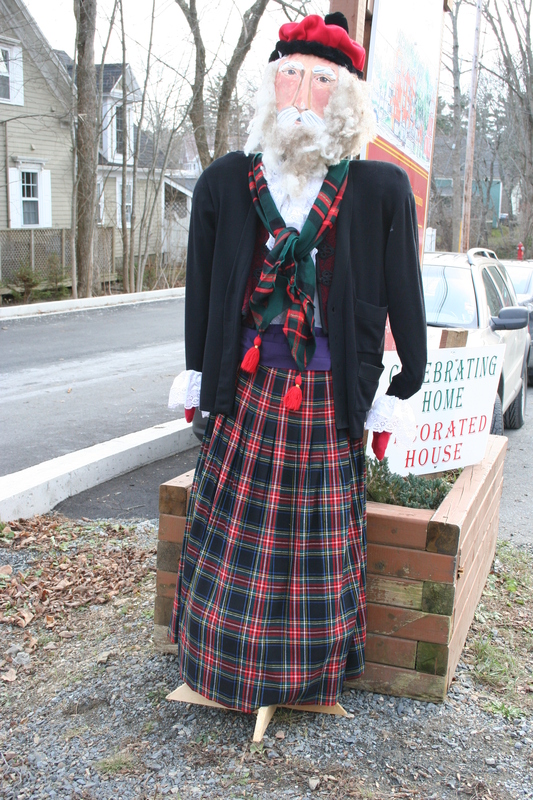 These special events attract visitors to the town and so help all the small businesses. We wandered round the town and Louise and I visited the decorated houses on display and photographed the figures, while the men went off to wash the car. We manged to meet up with Cameron and Jeff and headed home for a coffee. This one looks rather Scottish, don't you think? 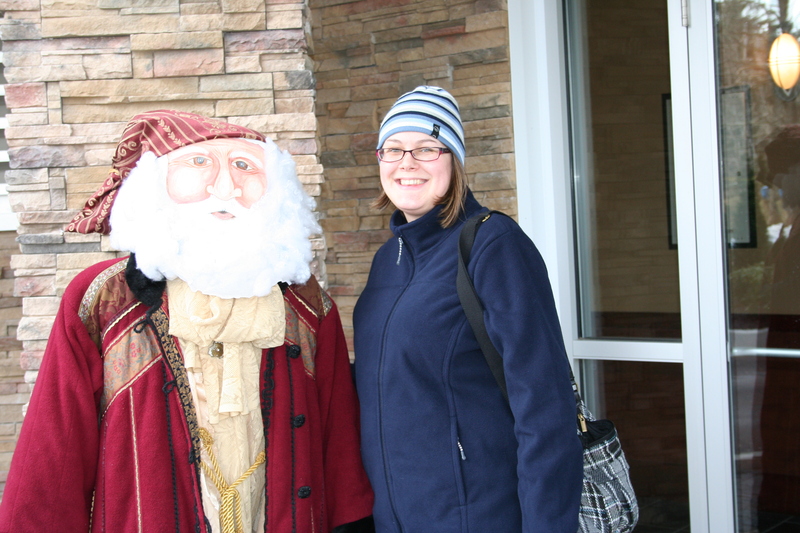 A nice day out to get us into the Christmas spirit.